Invite everyone on your guest list to join sweet Clara and the magical Drosselmeyer as the beautiful music of Tchaikovsky guides them through a wintry world. 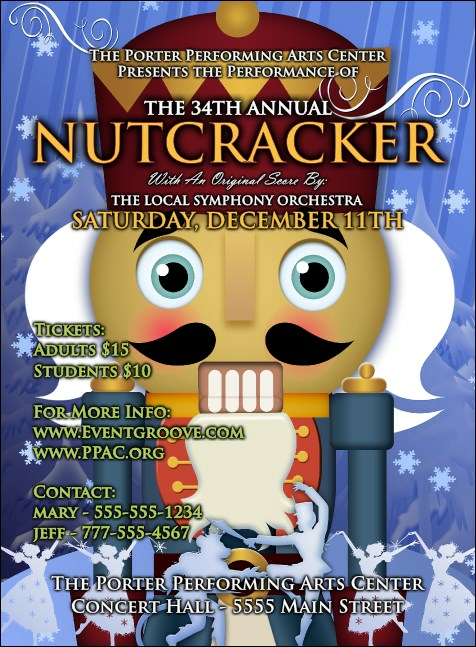 These Nutcracker Ballet Invitations feature the nutcracker toy’s rosy cheeks, big blue eyes and white hair in detail on a blue background with poised snowflake dancers along the bottom of the template. TicketPrinting.com helps bring your event come to life.